The TRS80's CPU ran at 1.77 MHz, available with 4,8 or 16 kb ram, 1 kb of video ram, keyboard and video ram are memory mapped, Microsoft basic built in to system rom. The Display was 64 x 16 lines or 32 x 16 lines , monochrome with limited Teletext style graphics giving 128 x 48 graphic cells. The only sound was from the cassette port and was generally not used by most programs, although I had a game called "Apple Panic" which produced the words "Apple Panic" rather well!. . Sometime in the early 80s I bought the Radio Shack (Tandy) Model 1. By 1982 I had the Expansion Interface ,RS232 Port and two Disk Drives. I later added an 80 column graphics card (The Gemini Z80 IVC card), this card used a Zilog Z80 instead of a graphics chip. The card gave 80 x 25 text and reprogramable character set in addition it had a battery backed up clock. To make use of this card I had to write a video driver (a section is show on the right) written in Z80 assembler, I also added extra commands to Basic to get time and date, program character set etc., I used a program called Edtasm+ to write the software. On the right hand side in this picture shows my Model 1 mounted in a metal cabinet to try and reduce the amount of radio interference, the Model 1 was completely unscreened and produced a great deal of "shash" on the lower frequency Amateur Radio bands. There are two 51/4" floppy drives, a Radio Shack single sided drive (83 Kb) and a Shuggart double sided drive (160 Kb). There is also an audio amplifier and a loudspeaker mounted on the front panel. In the foreground can be seen a bottle of Czech Budweiser. On the left hand side of the above photo can be seen an Atari 400, the membrane key board has been removed and replaced with an HP button keyboard, this was connected via a 25 pin D connector, I had to hand wire each button on the HP keyboard to map it correctly for the Atari.. The 400 had 48 kb of ram, CPU ran at 1.79 mHz , 4 Joystick Ports, multiple screen modes, horizontal scrolling, sprites and sound. The machine had slots for the CPU card and a RAM card, in addition to the cartridge slot. 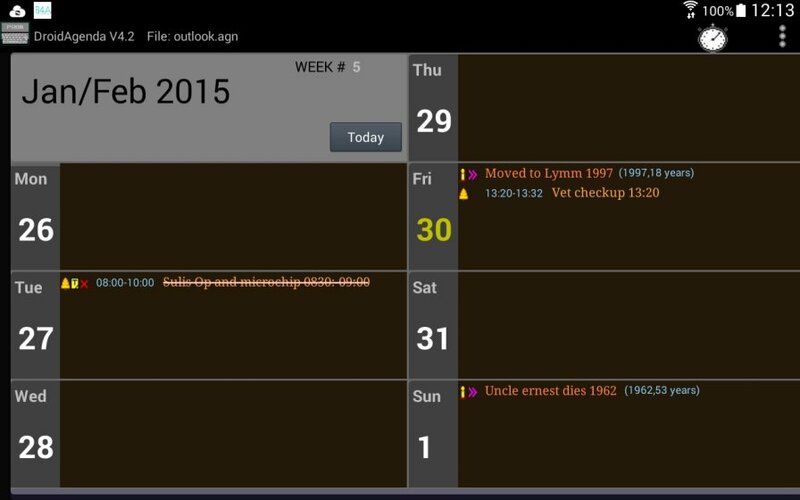 ANTIC: DMA, NMI, Horizontal and Vertical Scrolling, Line counter. CTIA/GTIA: Color control, Sprites, collision detection. POKEY: Keyboard, Serial comms, Pot (paddles) scan, Audio (4 channels), Timers, IRQ, Random number generator. PIA: Joysticks, Peripheral control, IRQ for Peripherals. 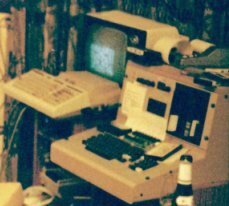 For a while I used the Model 1 as well the Atari 400, I used the Model 1 disk drives to load and save data via a serial link using the Atari 850 Interface Unit this gave me serial and printer Ports. I used both machines for learning machine code and Basic, I had a BasicXL cartridge for the Atari and this was a superb programming language for its time, full screen editing and even Sprite commands. The Atari 800XL had 64 kb of RAM and a few extra graphics modes and Basic built in to the system ROM, but only two Joystick ports, the reason for this was some of the Joystick circuits were now required to page the ROMS in and out. 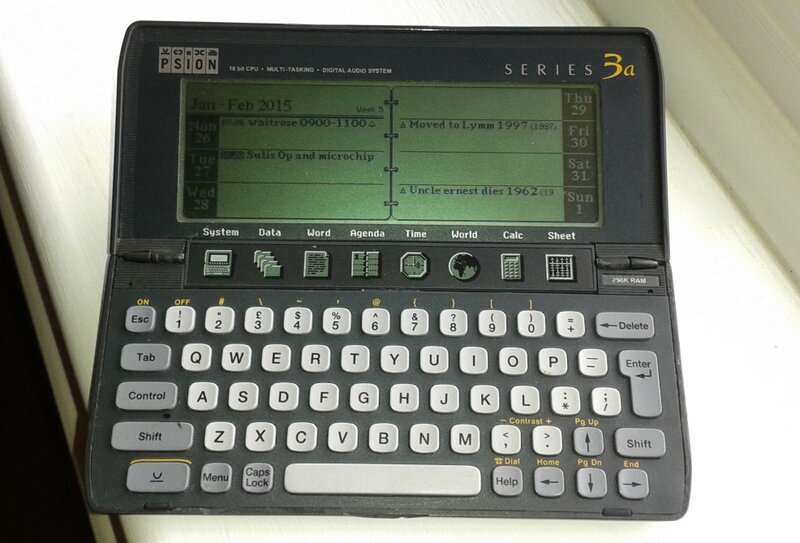 The ability to page out the ROMS allowed for alternate operating systems to be loaded, some versions of DOS loaded into the paged area. Later on I bought an Atari 800XL and the 1050 Disk Drive and TRS80 became obsolete. I fitted the 80 column board to the 800 via the Expansion port and wrote drivers to interface with the Atari's operating system, this was a great deal easier than the TRS80 as the Atari had the concept of "Handlers" for the peripherals, it was just a matter of writing the Handlers code and use the Open and Print# commands to access the 80 column board. 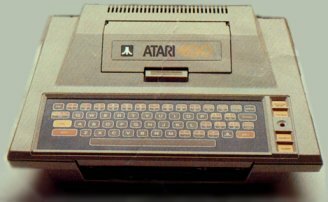 The Atari 520ST had 512 kb RAM, 192kb system ROM, clock speed of 8 MHz, 3.5 " disk drive, mouse, serial port, printer port, Cartridge port, Hard drive port, Max resolution: 640 x 200, Max colors on screen: 16, 3 voice sound, Midi port,. I bought my 520STFM in 1987, and later on added the ram chips to take it to 1024 kb, I experimented with the "C" programming language using "Hippo-C" but soon realized it was not for me, and I got "FastBasic" a cartridge Basic by a company called Computer Concepts, I remember writing a graphics image converter program using "FastBasic" with some 68000 machine code routines to speed up the intensive stuff. I also had a Midi keyboard hooked up , a Modem for use with BBSs (Bulletin Boards), a sound cartridge with sound in and out and a second Floppy Drive. The Amiga 500 had 512Kb of ram, 256Hb system rom, clock speed 7.1 MHz clock speed, 3.5 " disk drive, mouse, serial port, printer port, joystick ports *2, Max resolution 640*512, Max colours on screen 4096, sprites, 4 sound voices and speech synthesizer. I got my first Amiga in 1988 and sold my ST soon after, I programmed in 'Hisoft Basic' and 'Amos'. Amos was a basic like language but with 'Procedures' so in many ways it was similar to 'Pascal', one really cool feature is that the procedures could be 'folded', when a procedure was 'folded' only the first line was visible in the listing, it made programming easier as it was easier to navigate through the code. The Amiga 2000 had 512Kb of ram (expandable), 256Hb system rom, clock speed 7.1 MHz clock speed, 3.5 " disk drive with slots for addition drives, mouse, serial port, printer port, joystick ports *2, Max resolution 640*512, Max colours on screen 4096 (Video cards could be added), sprites, 4 sound voices and speech synthesizer. In addition it had two sets of expansion slots, one set for Amiga cards, one set for the optional PC card and associated ISA bus cards. The Amiga 2000 also had a 'Genlock' card slot. I upgraded to the Amiga 2000 mainly for the Genlock feature, I wanted to be able to superimpose the Amiga graphics on top of video. I added a 'Picasso' video card, 68030 processor plus additional memory and a hard drive,I also added the PC card to give me PC functionality, DOS only but most PCs were DOS at that time, it looked very crude compared to the ST and Amiga.